Clarke, an environmentally responsible mosquito control company, just keeps giving to Fossil Rim Wildlife Center on multiple fronts. Volunteers from the company have done several substantial and physically intensive projects at the park, but monetary donations have also been part of the equation. 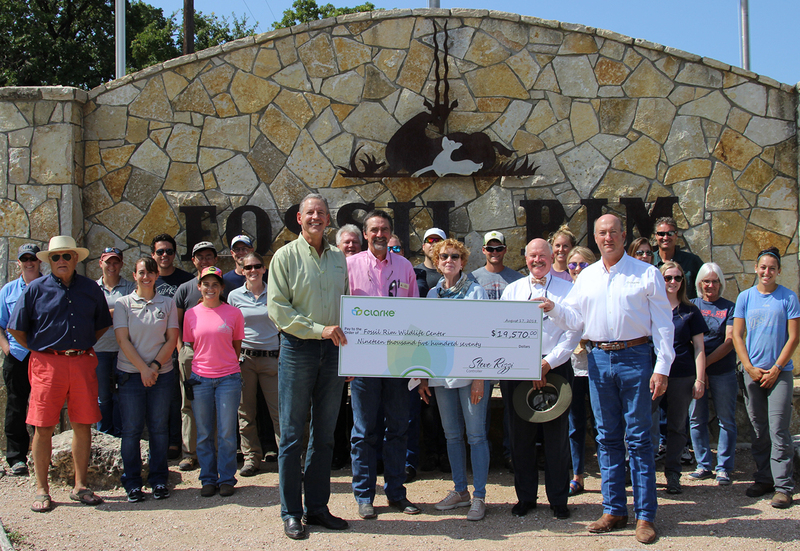 Fossil Rim was selected as a 2018 recipient for Clarke’s One For Tomorrow grant program, and that resulted in an Aug. 17 presentation of $19,570 at Fossil Rim. People pictured with the Clarke One For Tomorrow grant check in front of Fossil Rim staff at the wildlife park on Aug. 17 include (l-r) Clarke Domestic Unit General Manager Joel Fruendt, Fossil Rim Executive Director Kelley Snodgrass, Fossil Rim Board Secretary Jeannie Lane, Fossil Rim Board Chair John Holden, and Clarke Control Consultant Doug Carroll. “We decided to give one percent of the revenue from our NextGen products and services to nonprofit environmental organizations who share our values and passion for the planet and global community. We are the leader in public health programs for mosquito and vector control worldwide. We have seven regions – both in and out of the U.S., so each of our employees can nominate an organization within their region for the grant. Fossil Rim Board Chair John Holden and Executive Director Kelley Snodgrass also spoke at the presentation. Snodgrass mentioned how impressed Fossil Rim Lead Rhino Care Specialist Justin Smith was at how hard the Clarke staffers worked at the most recent volunteer project. 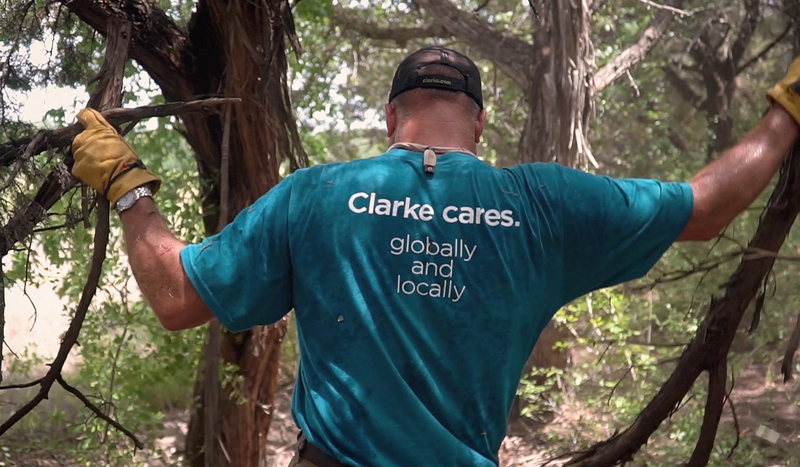 Clarke volunteers are known for their hard work when they come tackle projects at Fossil Rim. Other 2018 One For Tomorrow grant recipients include Burrumbuttock Hay Runners (Australia), Operation Blessing (Honduras), Queen Elizabeth II Botanic Park (Cayman Islands), Virginia Nature Conservancy, Wild Sheep Foundation (Montana), and Young At Heart Pet Rescue (Illinois). To learn more about Clarke, check out https://www.clarke.com/. Congratulations Fossil Rim and thank you Clarke . . . You could not have picked a better organization to honor with your donation!